I have officially been nursing for two years! While I was always open to "extended" or "full term" nursing from the beginning, it was hard to picture myself here. 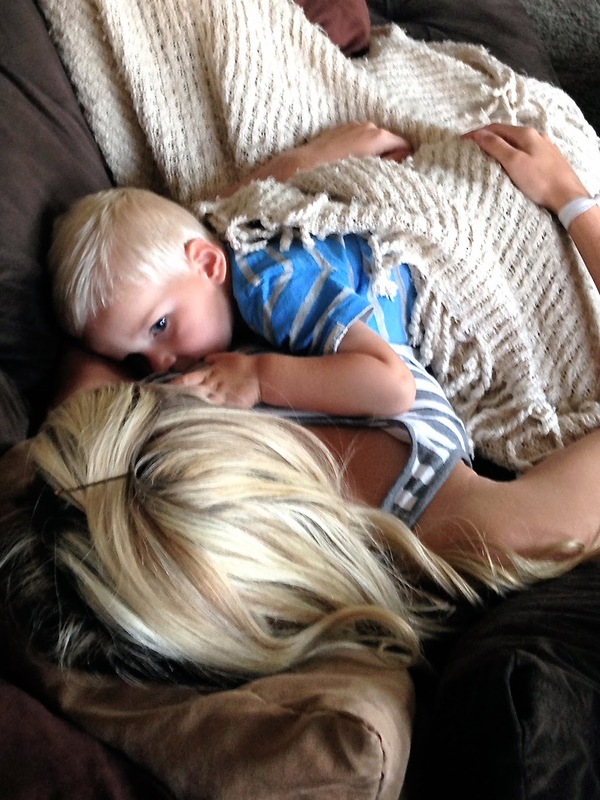 It was hard to picture what nursing a toddler looked like, since I really hadn't been exposed to it much. So here is a brief glimpse of me & my 2 year old nursling. To me... it is beautiful! I have never had an end date for breastfeeding; instead, my hope has always been that Liam will self wean whenever he is ready. However; A big however... I also really wanted to be pregnant by the time Liam turned 2. Well, his birthday is now behind us, and unfortunately we do not have another little one on the way just yet. It has started to seem as though we may need a little Rx help to get there, like we did with Liam (Clomid). We really hope this would not be the case, the second time around, but it may be becoming a reality. I cannot be breastfeeding while undergoing any treatments, so eventually we will need to make that difficult decision. I am starting to realize though that in my heart, the gift of giving Liam a sibling close to him in age far outweighs the gift of or desire for self weaning. He is still not yet ready to wean, and I am definitely not ready or prepared to start the process. For the near term, we will continue to explore & exhaust any options we may have available to us now. 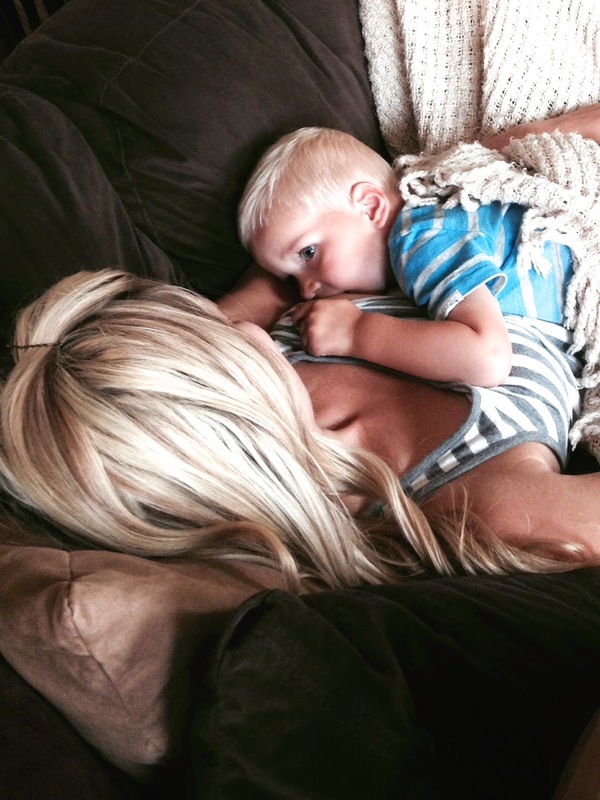 Nursing a toddler is just an incredible experience that I am so happy to have and not ready to give up. I want it to end when we decide, not because of any challenges with fertility. Fortunately, I have a tremendous support system of friends & family to help me through it. Although our decision to breastfeed into the toddler years may not be so "mainstream", we have found a wonderful community here in Salt Lake City that makes it feel like just that. I have become such an advocate for breastfeeding. I never thought I could be this passionate about a parenting choice, I just love helping & supporting other moms and I hope that someday I can become a La Leche League leader so that I can continue helping others on perhaps a grander scale. It fills me heart to hear that this little blog has already been a resource & support system for some. Breastfeeding is by far the topic that I get the most emails about, and even more so now that I am nursing a toddler and trying to conceive. I'll say it... I'm a full blown "lactavist"! With this milestone in Liam's life, I wanted to share a peek into he and my continued nursing relationship. My hope is that it will bring some insight and/or encouragement to those who may be curious or struggling on their own. While I was not successful Breastfeeding Noah I applaud you for doing it and continuing as long as both you and Liam feel it is right. Good luck with trying to conceive this go around. I too am struggling to decide when is right to try again. We also have to do fertility treatments and last time Ivf and pregnancy took so much out of me. I feel Noah needs and deserves so much of me at this age that I wouldn't be able to do it all at this point. I'm hoping after he turns 2 I will feel differently. Being a mom comes with tough decisions! Congratulations! Wow! Two years is quite an accomplishment! My heart always aches for the other moms who deal with infertility as well. It is not an easy road. this is fabulous, 2 years is a great accomplishment! Obviously I have zero experience but I hope to breastfeed when I have kids and I know it can be difficult. Right there with you. Jett turns 2 on Sunday and still not pregnant. Fingers crossed for us both that we can get preggers while nursing and don't have to stop because of fertility meds!!! I think its so amazing that you're still breastfeeding! And I love that you advocate for it! I wish you the best of luck on your journey to get pregnant with baby #2!! You're an amazing mama! I weaned my son at 18 months because I wanted a break and have my body to myself before trying to get pregnant again. I thought my son Ben would struggle with the weaning, but he did so much better than I anticipated. It's such an emotional journey and it sounds like you have a lot on your plate. I'm sure you'll make the best decision for your family. Ditto exactly what Elena said. ROCK ON! Love that you are an advocate for something so positive. Wow, this is amazing! Such an accomplishment! Sending positive thoughts your way for babe #2! I only want to breastfeed for a year but if I have trouble you can count on getting an email for advice! Pretty amazing mama! Beautifully written. We have a lot of the same sediments. Less than 2 weeks and we will be in the two year club too. I never imagined I would be here and has no idea what it would be like either. But it still feels totally normal to me so we will continue on! Sending my positive thoughts and vibes for baby #2!